Stretch marks occur as a result of stretching of the skin and are mostly seen during and after pregnancy, rapid weight gain, puberty and hormonal changes. They can occur on any part of the body, commonly seen on lower abdomen, thighs, hips, breasts and upper arms. They are of no health risk but are unsightly. Cause: There is a break-down of collagen in the deeper layer of the skin as a result of stretching. The outer skin remains intact but appears streaky. These stretch marks are pink or red when fresh but turns silvery white with time. They are permanent and the appearance is a concern to most. As long as the collagen is intact in the deep dermis the stretch marks cannot form. 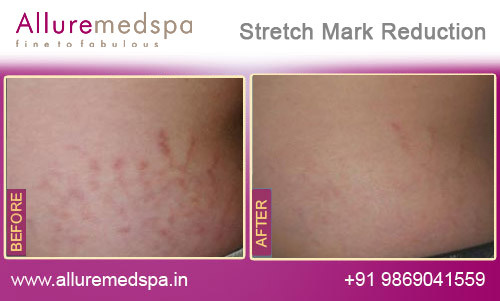 The most important benefit of laser stretch mark removal is its effectiveness. The treatment has a very high rate of patient satisfaction. A new fractional laser treatment can deliver micro-pulses deep in the dermis. This forms a new collagen in the dermis to reduce and fill in these stretch marks. Each of our bespoke stretch mark treatments works by stimulating collagen, the skin’s natural skin-healing protein. This causes new cell growth and rejuvenates your skin, reducing the appearance of the stretch mark. With its outstanding team of Dermatologists, Allure MedSpa helps you neutralize frown lines, wrinkles, fine lines and scars and stretch marks in its state-of-the-art facilities at highly affordable, value for money prices. No wonder, patients from all over the world throng Allure MedSpa to achieve their cosmetic and skincare goals. We bring you innovative technology, all administered by an expert team who will tailor your procedures to your individual needs. With stretch mark removal treatments available for all skin types, our expert Dermatologists will work with you to devise a treatment plan tailored to your stretchmarks. 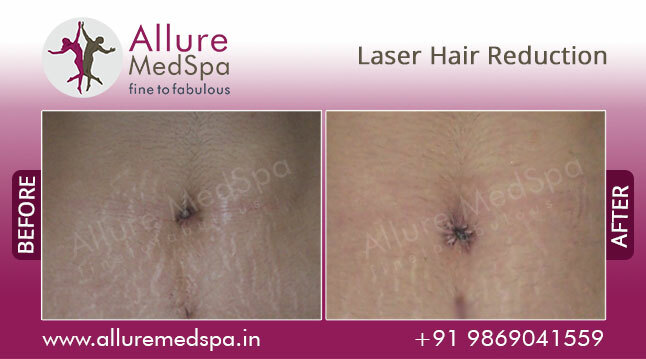 Immediately following laser stretch mark removal, the affected area will be mildly red and tender. This is because layers of scarred skin have been removed and new skin is being grown. But all these are temporary. Following your dermatologists instructions will ensure optimal results. 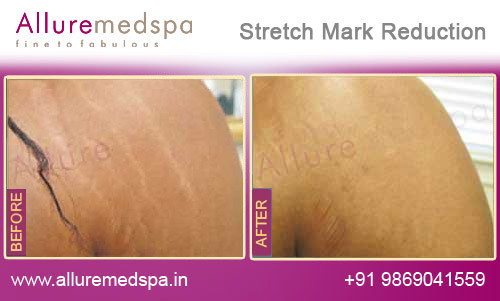 Stretch mark removal treatments are highly effective at dramatically reducing the appearance of stretch marks. Stretch mark removal treatments take between half an hour and 4 hours, depending on the size and nature of the area being treated. Depending on your skin, the nature of your stretch marks and the treatment you choose, we normally recommend a course of 6 to 12 stretch mark removal treatments for best results. You can expect long-lasting results from your stretch mark treatment, though this will vary depending on your lifestyle, age and skin condition. As with any other technique, success is dependent on the prevalence and age of the stretch marks in question. Each case is unique. Allure MedSpa which is renowned for its state-of-the-art internationally acclaimed services,offers affordable and cost effective weight-loss and cosmetic contouring procedures. To know more about the cost of your procedure request a consult by filling the form below.Your consultation is your chance to ask questions about stretch mark removal treatment and put your mind at rest. Our surgeons and cosmetologists will be there to offer full explanations and answers to all of your queries. 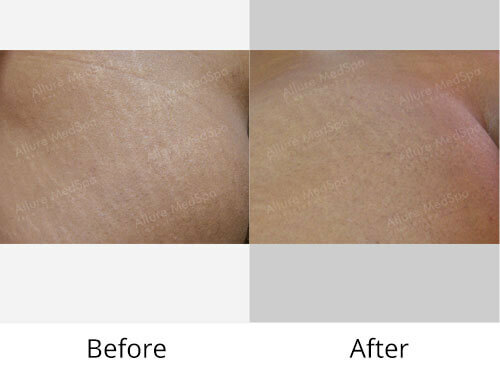 While there are many suitable candidates for stretch mark removal, the most common patients are women who have recently given birth.Patients should have realistic expectations about the results that their desired treatment method can offer. Stretch marks are tiny tears in the dermis that are scars and can vary in color from a light pink to a dark purple. Over a very long period of time, usually years, stretch marks can fade in color, but the scars remain. There are several different factors that contribute to the formation of stretch marks.Heredity – Some skin is genetically prone to stretch marks Skin Type – Some skin is dryer with less elasticity than others i.e. dry skin vs. oily skin,Weight – rapid gain or loss,Pregnancy – the weight gain associated with pregnancy.Although some people are more susceptible to stretch marks, anyone can get them.Stretching of the skin during rapid weight gain or rapid growth (in young children and adolescents) is a major cause of stretch marks.The non-occurrence of stretch marks during one pregnancy does not necessarily mean stretch marks will not occur in another.Stretch marks are not gender specific – men and women are susceptible to these unsightly marks. How much do treatments for stretch marks reduction cost? 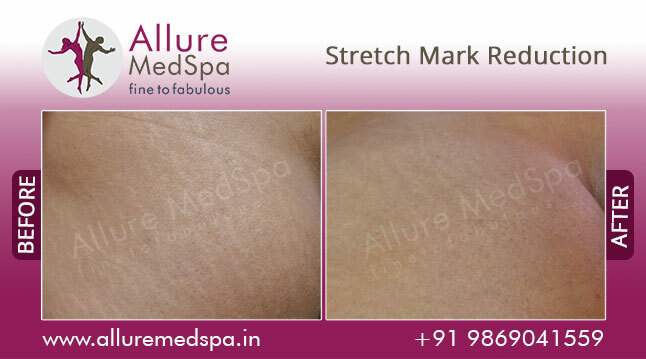 The actual treatment required for stretch marks reduction varies depending on your personal requirements, but to get an estimate on how much stretch marks reduction treatments may cost you, please Call us now on +91 98690 41559 or use our online enquiry form for our latest prices. 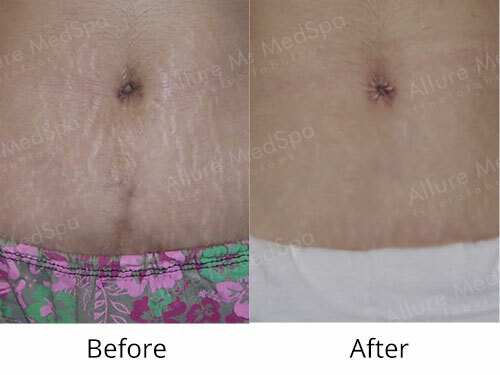 Contact Allure medspa today to discuss your individual needs – we’ll arrange a consultation with one of our specialists on how to reduce stretch marks.